To see a titan cut down above your ringside seat is to marvel at monstrous brutality and human purity. It is to experience boxing's ultimate high, while finding sympathy with the abolitionist. Heavyweight boxing - in its purest form - is just so destructive. And so dangerously addictive. On Saturday at London's O2 Arena, Anthony Joshua went from mildly stimulating to eye-poppingly potent. The frenzied reaction that greeted Joshua's seventh-round knockout of a game Dillian Whyte said it all: heavyweight savagery is boxing's signature dish - and Joshua stuffs fans full of it. Cometh a man who not only serves it up in spades but can take the roughest of licks. A left hook landed by Whyte in the second round would have knocked most men cold. Joshua, having walked through 14 previous opponents, shook it off, regained his shape and wrought revenge. And how spiteful was the finish. Having sent Whyte reeling with a right to the temple, Joshua stalked his wounded quarry with relish - blood in his nostrils, swinging a slaughterman's axe. But amid the shambles, Joshua delivered the telling uppercut with a surgeon's precision. The sight of Whyte dangling on the bottom rope, senses scattered about the canvas, cut through the rapture like a shiver. In 19 minutes and 27 seconds of boxing, Joshua learned more about his craft - and himself - than in his previous 14 professional contests put together. The 26-year-old from Watford now knows his whiskers smooth out when ruffled; that he can recover from a crisis; that he can haul that hulking frame through six and a half rounds of thickening mayhem; that he can muster the same power in the middle rounds as he can at the sound of the opening bell. 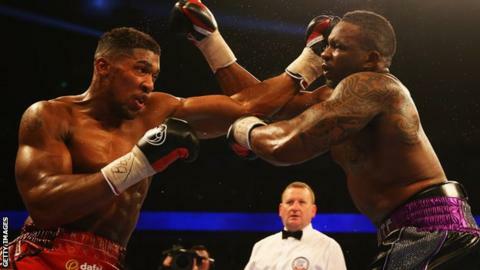 "Dillian was very strong and very game," said Joshua, who has been tipped for superstardom since winning super-heavyweight gold at the 2012 Olympics. "Some fighters don't know how to handle getting hit. But I showed I've got heart. I cleared the red mist, took round three off and reverted to what I'd been told. I started boxing, using the overhand right more than the left hook, and it got him out of there. That fight was what I had needed for two years." Joshua also now knows it is not wise to let his emotions get the better of him. Whyte, who called his rival "a scumbag and a fake" during an ill-tempered build-up and holds a win over Joshua in the amateurs, wanted it to get personal and got his wish. Joshua, no stranger to street law despite the affable patter, likened the early stages to a fight on the cobbles. But when he stopped loading up on every shot and applied some science, Joshua was in a different neighbourhood. However, Joshua doesn't want to abandon the street altogether. That affable patter and beaming smile will get the plenty of grannies onside but far better to be a nasty piece of work between the ropes. When the gloves are on and the fists are pumping, Joshua does nasty as well as any big man since Mike Tyson. Asked to explain his late flurry of blows that caused an alarming ring invasion at the end of round one, Joshua replied: "It's not golf, is it? It's a fight. I enjoyed showing that talk is cheap. There was bad blood between us." Asked whether Whyte had earned his respect, Joshua replied: "No, not really." Joshua was presumably referring to Whyte's qualities as a man rather than his boxing ability. No great stylist, Whyte did prove himself to be a man of iron chin and will. But he also proved that while standing and trading with Joshua might bring a certain amount of success, it's only going to produce one winner. However, there is one man out there, his fin sharking through the foaming, quickening soup that is the British heavyweight scene, who knows better. Indeed, Tyson Fury could be Joshua's worst nightmare. Just as Fury was Wladimir Klitschko's worst nightmare when they fought a fortnight ago. Not only did Fury use his superior height and reach to great effect against Klitschko, he confounded Klitschko with his movement. And if the man who had reigned over heavyweight boxing for the best part of a decade couldn't lay a glove on Fury, Joshua would do well to steer well clear. For now, at least. Whether Fury beats Klitschko in a rematch next summer or not, a fight between Fury and Joshua will happen. British boxing fans will be keeping everything crossed that Fury still has his two world title belts when it does. North versus south; cunning versus thunder; pantomime villain versus avenging angel; one with a black hat, the other with a white hat. As Sonny Liston used to say of boxing, "like a cowboy movie". Two characters fed into the promotional machine and robbed of any subtlety and nuance. It would sell out Wembley Stadium twice over. In a minute. And might not last much longer. Meanwhile, the task of Joshua's promoter Eddie Hearn will be a difficult one. "After that performance against Whyte people will be saying Anthony Joshua is the real deal," said Hearn. "But he still has a little bit of work to do. "People say to me, 'Put him in with Fury or Klitschko or [WBC champion] Deontay Wilder.' We'll get there. In the meantime, that fight against Whyte was so important. "That was a lot of pressure on the young man's shoulders. He'd only had 14 fights and was headlining a pay-per-view card at the O2. After two rounds it caught up with him; there was a lot of emotion and nervous energy. But that experience will be vital in him becoming heavyweight champion of the world." Joshua's first defence of his newly acquired British title - if Hearn chooses to take him down that route - will be in April and a fight against fellow Briton and former world title contender Dereck Chisora would seem to make sense. Then again, Chisora's best days are behind him - he was knocked out by David Haye in 2012 and totally outclassed by Fury last November - and an early finish would be construed as a step in the wrong direction. Haye, who makes his comeback in January after a three-year lay-off, would be a step too far. Hearn also mentioned pitching Joshua against the winner of Vyacheslav Glazkov and Charles Martin, who are set to fight for the vacant IBF belt next spring, Fury having been stripped for fighting Klitschko again. However, Joshua is ranked only eighth by the IBF and might have to wait his turn. All of which means Joshua and Whyte might do it all again. Given what went off in London on Saturday, not many would be complaining. In an era when heavyweight savagery is a rare old treat, Joshua is a veritable, moveable feast.